Please note; This plant species guide, does not apply to other small volume vertical garden pots! More potting mix per plant, more room for roots to grow and more potting mix water retention. The holes at the bottom of Wallgarden products, are designed by quantity and size to give correct aeration of the potting mix and ensures no potting mix flows through with watering. There are a number of quality potting mix’s suitable for vertical gardens available, here is what to look out for; Contains well composted Organic substrates as Bark, sawdust and CoCo Peat, Particle sizes from 0-12mm. A mixture of mature compost/Humus (composted thermophilically for 12-20weeks), these can be sourced fully composted -Cow, Chicken manures, Worm castings, compost bins, etc for nutrients. NB. Coir peat will help with water retention and aeration. Vermiculite or perlite can be added for water retention and aeration also. This plant guide was kindly provided by Keri Algar. For a full plant guide and further information, please see www.diyverticalgardens.lushlivingwalls.com. The quintessential fern, the Boston variety is the more commonly known, is easy to grow and typically found in containers and hanging baskets. Like most ferns it grows best in full to partial shade, but will withstand partial sun. Hailing from tropical climbs of the Americas it prefers warmth and humidity, and will require being indoors in winter in temperate climates. It will thrive when well watered and in rich soils. It prefers a neutral to acidic soil and will grow slowly and steadily. It may outgrow vertical garden containers in which case simply split up the rhizome (roots) and replant. This is another fern that lives successfully in containers, requiring the same conditions as the Boston fern. Bird’s nest ferns have broader and more fragile leaves, which may damage easily, so it is best to leave them with a bit of room to grow. The yellow-green leaves offer bright contrast against darker greens in a wall composition. Asplenium Floralee is a cold resistant version option that needs perhaps a bit more humidity. It has more detailed, delicate fronds. And let’s not forget the famous hen and chicken fern (Asplenium bulbiferum), well known for its hardiness in cool and even drier climates (it is still shade loving, though). The rabbit’s foot fern takes its name from the fuzzy exposed feet (rhizomes, roots or creeping stems) that stick out from its base. These rhizomes can be broken off and planted to establish new plants. Native to tropical Polynesia, this fern requires similar growing conditions to the above ferns (warmth, bright shade), but may not require quite as much watering. Pothos, especially golden pothos (Epipremnum pinnatum Aureum) is a classic houseplant the world over for good reason. It is one of the more forgiving indoor plants, tolerating low-light or bright light, watering or dry spells, rich soils or poor soils, neutral, alkaline or acid environments. It is hard to get it wrong. As a trailing vine it is a smart choice for a vertical garden as it can be encouraged to spread and fill any gaps. Pothos is considered an aggressive grower and care should be taken if planted outdoors: it grows fast and will need liberal pruning. It is native to Solomon Islands and other parts of the Pacific. Golden pothos is ranked highly in the list of plants that remove VOCs from the air. It has attractive bright green leaves with yellow and gold variegation. Care should be taken with Australian native monstera (Epipremnum aureum), as it can be toxic to pets. This is a beautiful cascading plant often found in hanging baskets and very suitable for a vertical garden. It will trail downwards and climb upwards. Vibrant red flowers emerge from its sprawling stems and deep green leaves, flowering sporadically yearround to stunning effect on a wall. It does prefer warmth (sub-tropical) and humidity, so as with the aforementioned plants, unless you are in a warm, even tropical climate, indoors is best. It likes bright indirect light and a neutral to acid environment. This striking epiphyte latches onto tree trunk and branches, so it is well suited to vertical gardens with limited growth media. As their name suggests, staghorn ferns are unique looking and will stand out in a garden. They do enjoy a warm, shady, tropical environment and plenty of moisture, however this must be very well drained. tropical environment and plenty of moisture, however this must be very well drained. While fairly maintenance free, staghorn are fond of potassium. This is a lovely ground covering with tiny, bright green leaves that give a delicate and soft appearance to a wall garden. It will flourish in bright light and even do all right in full sun so long as the sun is not too harsh and the plant is watered. Baby’s tears prefers well-drained soil of a range of pH levels in a temperate climate. Mild frosts will set its growth back a little but it will rebound in warmer weather, or will be fine indoors. This good old-fashioned plant is a hardy evergreen vine (or ground cover) found flourishing in cities around the world. It is also well regarded for removing VOCs from the air. English ivy is easy to grow and with its lush foliage it can look dramatic on a living wall. Do not be afraid to prune it back, as it can become a little invasive and aggressive. The vine enjoys a reasonably fertile soil with moderate watering and good drainage. It will handle a range of pH levels. Another excellent VOC remover, the purple waffle plant is an elegantly trailing evergreen perennial in warm to tropical climates. Its purple and silver foliage makes a nice accent plant on a wall garden; it is also used as a fast growing ground cover. Tiny white flowers bloom in spring and summer. The purple waffle plant loves warm, fertile and wet, but well-drained, conditions. It can handle a range of pH levels. fertile and wet, but well-drained, conditions. It can handle a range of pH levels. A full to partial sun lover, silver falls fills gardens swiftly with its pretty heart-shaped leaves. It is a trailing plant that looks fantastic in a wall garden and is a perennial evergreen in warm climates. In cooler climates it is frost-sensitive and will grow as an annual: if planted as part of a larger evergreen wall garden its best to be in a suitable climate. Silver falls is comfortable in alkaline, neutral or acidic soils. Though it likes to be watered moderately, it is recognized as a heat and drought resistant plant. Eye-catching colors accompany these vividly named varieties of alternanthera. Generally bushy and exceptionally heat resistant, these varieties are evergreen and will need to be planted on an indoor wall in cold climates. Being heat resistant does not make alternanthera drought resistant though and they enjoy moderate watering in well-drained media. They grow well in acidic, neutral or alkaline environments. The wax flower is a creeping vine suited to sunny indoor walls or outdoors in particularly warm and humid areas. It has intensely fragrant and eye catching flower clusters, which bloom repeatedly. The wax flower likes a lot of sun and water, but will prefer well-drained soil and to be dry between waterings. It requires a little less attention when not in flower in winter. It will survive in varying pH. Wax flower has one of the highest VOC removal rates. Endemic to Australia, a dwarf bower wattle is an attractive emerald green grass. Unlike most Acacia species that have fluffy clusters of bright yellow flower heads, the bower bottle does not flower. Bushy, low growing and compact, the bower wattle requires little maintenance, save the occasional watering. It prefers well-drained soil and can a handle a range of pH levels, from alkaline to acidic. While it does well in full sun, the bower wattle will also cope with partial shade. Geraniums are low growing herbaceous perennials recognized for their versatility, fleshy leaves and often-bright flowers. The most widely distributed geranium has to be the big red ivy variety that copes in very hot, sunny situations. Another populargeranium is cranesbill, which features distinctive leaves and white, blue and pink flowers. Most geraniums enjoy reasonably fertile and well-drained soils in a range of pH levels. They definitely enjoy being dry between waterings, but will not fare well in desert-like conditions. A garden classic and easy to grow, there are myriad colors and cultivars of petunias for every garden and every climate. Opt for petunias suitable for hanging baskets, as these are ground covering in habit and will grow bushy, falling over a vertical garden’s structure. With relatively small root systems, petunias are a good choice for containers as well. Petunias enjoy hot sun, fertile conditions, a neutral pH, moderate watering and good drainage. In warmer climates some varieties may bloom year-round. There are over 250 species of verbena to pick from, but species such as Canadian vervain suit vertical gardens for their mounding and floriferous habits since other species may be less herbaceous and more upright. They are also easy to grow, heatand drought tolerant. To stay bushy and flowering, Canadian vervain really needs to grow in full sun. It also likes a neutral to acidic pH and particularly well-drained media. Alyssum is best known for its heat and drought hardiness. It is low growing and produces small clusters of pretty and fragrant flowers, often white but also in an array of other colors. It requires very little maintenance, so long as it is positioned in a partial sun to sunny spot, with adequate moisture and drainage. Alyssum does notrequire much feeding and is happy in a neutral to slightly alkaline medium. Look for an alyssum local to your region; some, though not many, will tolerate a light frost. Known in South Africa as Kappertjies, nasturtiums are another easy to grow companion plant that is edible too – their petals and leaves offer a peppery flavor andkick to a garden salad. Used to lure aphids away from other plants in the garden, Nasturtiums are also a spiller plant and will sprawl over a vertical garden, their bright flowers adding a bit of spark. Provide nasturtiums with a fertile soil and regular water. Bok choy is a cool to mild weather vegetable that likes sun, nutrition and a neutral to slightly acidic soil. This depends on the variety, and some are able to grow well in shady areas. This tasty vegetable will grow quickly with moderate watering so long as the medium is well drained. Bok choy is usually frost tolerant but if temperatures are consistently too cold (or too hot) the plant tends to bolt, flower and become bitter tasting. Plant in early spring. Spinach is an easy to grow vegetable and a quick producer. It prefers full sun in a fertile, neutral to slightly alkaline medium. Average watering is fine for spinach, and it will like a bit of fertilizer once the plant begins to flourish. Spinach grows best in cooler temperatures and will bolt as soon as temperatures rise. Plant in early spring after the frosts, or in winter in frost-free climates. after the frosts, or in winter in frost-free climates. Crisp and tasty, easy and fast growing, lettuce is a staple in gardens around the world. There are dozens of varieties to choose from, including smaller compact varieties perhaps better suited to vertical gardens. Garden lettuce is a cool weather lover, but needs full sun, regular watering and a nutrient-rich soil to thrive. It is best planted in early spring after the frosts, or in winter in warmer, frost-free climates. Its foliage will quickly become bitter if subjected to hot weather, where it will also begin to bolt. Ornamental and edible, small chili plants are a winner in a vertical garden. Best planted high and out of reach of little hands who will regret a painfully hot surprise! Chili plants also like hot and sunny conditions, average water and well-drained mediums ranging from neutral to slightly alkaline pH. Look for low-growing, compact and bushy varieties such as prairie fire, razzmatazz or garda chandelier. There are many more varieties to suit an individual’s penchant for spice. Like beet, radishes also like a friable medium (light and crumbly for root growth). They are best grown from seed and are fun, fast and easy to grow. Radish really prefers mild to cool climates, so are best planted in early spring or late autumn in areas where summers are hot. They will flourish in full sun, a fertile, watered and well-draining medium. When growing a vegetable for its root the nutritional focus should be on phosphorus and potassium instead of nitrogen (as nitrogen encourages above ground foliage growth). With a very small root system scallion is a choice specimen for a vertical garden. Their upright greens are hollow, rounded and edible, as is their small white bulb, similar to a mild and sweet garden onion. Full sun, moderate watering and a rich medium will ensure strong and steady growth. Frost-hardy varieties will grow in winter, others plant in spring through autumn. As its Latin name suggests – ‘always living’ – this is a hardy succulent. 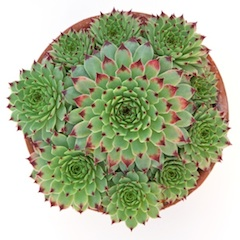 Sempervivum is an alpine succulent, used to eking out a living between rocks and crevices. It takes a black thumb to knock one of these about. Sempervivum will happily squish into a vertical planter. Each rosette is a separate plant, and is monocarpic – it will die after it flowers – but is quickly replaced by new rosettes. They look good combined with echeveria as well. We depart from the hen and chick variety for sedum. It is taken from the Latin word, ‘to sit,’ as it is a fantastic ground covering, spreading quickly and thoroughly. Filling any unsightly gaps, sedum is an excellent choice for a vertical garden. Sedum ternatum is the most widespread sedum found in the US. Aureum, oreganum, angelic and blue spruce are other options. Burro’s tail is a drooping variety and particularly eye-catching. In nature most are epiphytic and are accustomed to attaching themselves to trees or between rock crevices. Their hanging stems make them a fine choice for a wall garden as well. Most prefer partial sun to shade, and perhaps a bit more moisture than most succulents – a good option for the bottom of a wall garden. Many have hanging stems making them excellent hanging basket specimens. Most prefer shade and some humidity; in fact, hot baking sun may damage their leaf-like stems. The beauty of chives is that they are easy and quick to grow, not to mention a tasty treat in the kitchen. They also have pretty, lavender or white flower heads that will brighten up a vertical herb garden. Grow chives in full sun in a rich, well-drained medium and water moderately. Best planted in early spring. In autumn, take out thebulbs and break them as up as they have a tendency to clump together. They can then be re-planted. Low-growing, ground-covering varieties such as aureum or hirtum are slightly slower growing than their common cousins, but will grow compact and dense to fill the space in a vertical garden. Its sweet aroma is heightened when planted in prime conditions: full sun, poorish soil and good drainage. It is a very easy herb to maintain. Oregano is fairly heat resistant and prefers a neutral to slightly alkaline environment. It is also a good companion plant and is said to repel pests.